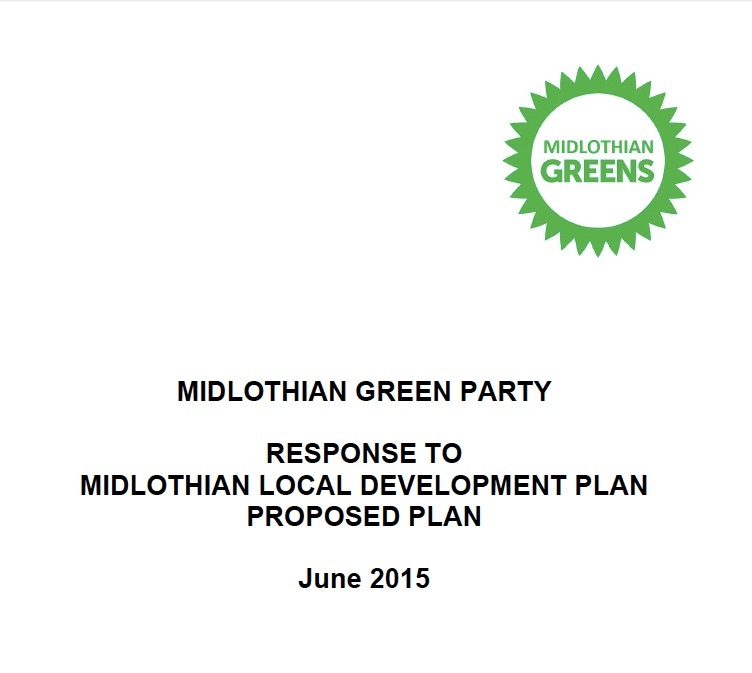 Midlothian Greens have condemned the Proposed Midlothian Local Development Plan (MLDP) as totally lacking in sustainability, and risking turning Midlothian into a suburb of Edinburgh. The MLDP was approved by councillors on 16th December 2014 and is described by Midlothian Council as representing the council’s settled view as to what the final adopted content of the plan should be. The statutory period for representation/expression of opinion runs from 14th May to 26th June and comments can be submitted on the Council’s web site during that period. At the meeting on 16th December, Midlothian’s Green councillor Ian Baxter voted against approval on the basis that it did not offer a sustainable future. The response now published and submitted by Midlothian Green Party to the consultation spells out in detail why we believe this to be the case. This entry was posted in News on 2015-06-16 by admin. I agree that the MLDP is unsustainable. I am glad our green councillor voted against it. The present infrastructure is already under strain with Dalkeith GP practice closed to new patients since April 2014 and other practices finding it extremely difficult to recruit new GPS and offer appointments less than 2 weeks ahead. Midlothian residents have chosen to live in a semi-rural county. Soon there will be no green belt and all the communities within Midlothian which have their own individual identities will coalesce into one big concrete sprawl. Our quality of life will diminish. The 12,000 new homes proposed will produce as many if not more cars. We’ll see more pollution and traffic gridlock like that at the Sheriffhall at morning and evening commuter times all over Midlothian. I refer to the headlines in the Midlothian Advertiser 25 Jun 15. The Greens are to be applauded for pointing out the lack of transparency regarding the seminar on 9 Dec blocked to the general public. With regard to the land farmed by The Telfers on the Old Pentland Road, Loanhead, this has been tantamount to a present day Highland Clearance where prime agricultural land is to be used for a film studio. Why build there? The tax breaks for the film industry are Eire. Appalling and underhand tactics that stinks of corruption throughout. Go for it Greens and blow this wide open!